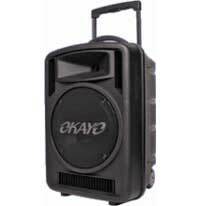 Here at Hire King we have the perfect solution to your portable stage hire needs for your next event. Suitable for a variety of events, our stages can be used for presentations, bride and groom seating, podiums etc. Our stages can be customised from 40cm to 100cm high. Our standard heights are 40cm and 60cm which are the most economical options. Our stages are suitable for outdoor use and can be setup on grass, concrete, compacted sand or pavement. We take safety very seriously and will generally ask for a photo or in some cases do a site visit if we have any concerns. We will generally not setup stages on very uneven or inclined locations. 4m x 3m, 6m x 3m, 8m x 4m, 12m x 4m. Essentially we can most sizes and will be happy to discuss your requirements and suggest an appropriate stage size. We ensure that your stage looks good and is safe. We can provide black skirting to cover all sides of the stage and can even put up a backdrop behind the stage. We can install steps upto the stage for ease of getting up and down. 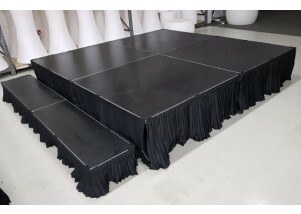 We also have stage guard rails available which can be installed on the back and on the sides of the stage. All stage hire prices are quoted on an individual basis. We aim to provide an affordable cost that will fit within your event budget. All stages must be installed and dismantled by our trained staff due to the specialised nature of the equipment. Through our comprehensive audio visual inventory we can provide hire of speakers, lighting and other items for your stage. Q:Can I pickup the stages from your store? As the stages need to be connected and setup properly they must be setup by our trained staff. We offer competitive delivery and pickup pricing all around the Perth Metro area. Q:How much does it cost to hire a stage? Stage hire requirements vary for each event and we will be happy to provide a competitive and affordable quote for your event. Q:How do I hire a stage? 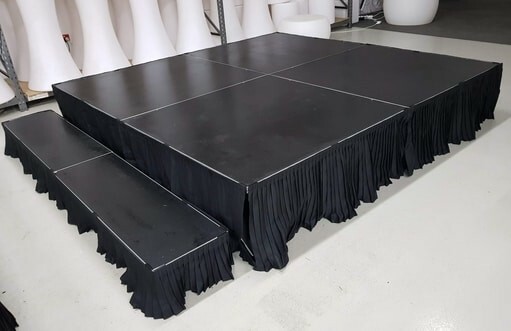 Easy, just click on the "Add to Quote" button on our "Custom Stage" item and fill out your requirements, add any other items you wish to hire from us and checkout. We will be in touch (usually the same business day) with your quote. Alternatively just give us a call on (08) 6180 3899 and we'll be happy to help. Please click "Add to Quote" and let us know a bit about your stage requirements. From theatrical plays to music concerts, from corporate events to political conventions, stages have been, and continue to be, significant contributors to the fame and success of musicians, dance troupes, singers, fashion models, social activists, politicians, and many other personalities and celebrities. As a city of international standing and repute, Perth plays host to a variety of local and international events, and as a result, the demand for stage hire as well as stage equipment hire has grown tremendously. Therefore, it comes as no surprise why a number of reputable, Perth stage hire and stage equipment hire companies have been established … Hire King being one good example. Of course, there’s another BIG reason why stage hire, and even stage equipment hire services are so much in demand. This is because they can cost hundreds of thousands of dollars to purchase, depending on complexity of concept, size, materials, lighting, allied equipment, and logistics. Therefore, it makes sound investment-saving, sense to opt for stage hire services whenever the need arises. Stages can range in size, shape, height, material and detail depending on what event or on-stage performance they are intended for. Apart from this, the type of stage will also depend on the concept or theme of the event. For example, if you need to hire a stage for a fashion show, you may, require an additional section to be fitted to the stage to acts as a catwalk, if necessary. Fortunately, Hire King, like other Perth stage hire and stage equipment hire companies, offer various types of stages, ranging from elevated, standard platforms to more elaborate ones that can be designed or altered to suit your particular theme and requirements. In addition to stages, stage hire companies also offer stage equipment hire options including PA systems, Audio systems, and other relevant on-stage entertainment machines and systems. Size – These are important factors to consider. For example, if you need a stage for an outdoor event, such as a music concert, the stage hire option you choose will be required to be of adequate size, both to accommodate all on-stage performers, and the other stage equipment hire options used. Height – (stage elevation) is also important, as some outdoor events or concerts are held on flat ground, making it difficult for viewers seated in the back rows to see the artistes, or other acts performed on stage. Keep this factor in mind before you avail of stage hire offers. Lighting – One of the most important factors for successful stage shows. No range of stage equipment hire options will be complete without stage lighting. Hire King, as well as other top, stage hire companies, offer several options in eye-soothing and attractive plain and multi-colored stage lighting, including stage floor lights, pedestal-mounted lights, suspended overhead lights, and more. You can choose a set of lighting combinations that go with the theme or concept of your show, and if you so desire, you can also hire laser lights, strobe lights, and even hazers, fog machines and smoke machines to add value to the lighting you’ve chosen. Hiring the right type of stage hire systems and appropriate stage equipment hire products are keys to the success of any event or show you plan. And if you wish to cut costs and add to your profitability, get in touch with Hire King.